Believe it or not, it’s time for the 2018 Annual Spring Workshop. The workshop is quickly approaching Scheduled for June 7-9, 2018. The venue is once again the Crown Plaza Hotel and conference Center in Plymouth. 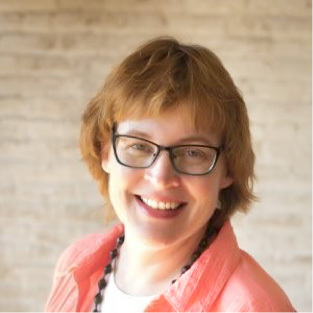 Julie Linden is our advanced speaker presenting on Hypnosis is for Everyone: Tailoring Hypnosis for Culture and Gender. The topic is very timely. The registration for the June Workshop has been much slower than recent years for many reasons including web site registration problems. These have been identified and corrected. That said, we have about 20 registrants for the Intermediate/Advanced Workshop as of this writing. Please reach out to all your friends and colleagues and invite them to a wonderful presentation. The Annual Spring Workshop is an important transition for our organization. Retiring board members step aside while new board members step into new shoes. 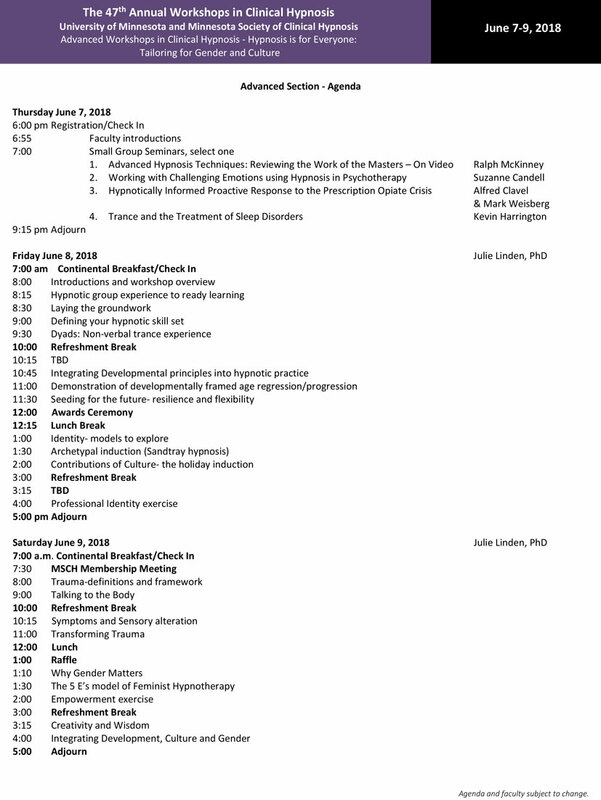 I would like to offer my personal thanks and appreciation and invite everyone to thank our retiring members this year at the Annual Membership Meeting Saturday June 9, 2018 at 7:30am. These true “MSCHers” have generously given their time, talent, and wisdom to our evolving organization. Greg Heberlein MA, LP is stepping down from his role as Membership Committee Chairman after 6 years of service. 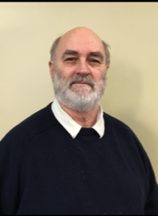 Mark Gemmell PsyD, LP is stepping down as Board Secretary after 6 years of service. Each has brought their unique talents to our monthly meetings and our organization. 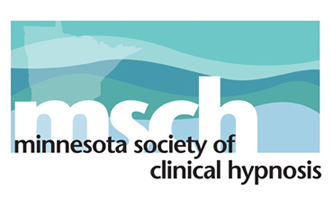 Joining the MSCH Board is Lisa Kastenbauer LMFT, MSEd and Catherine Russell LICSW. I will be stepping down as President to assume the role as Past President and Education Committee Chairman. 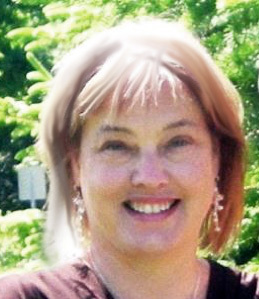 Cheryl Bemel PhD, LP is stepping into the Presidents role. The organization is fortunate to have such a talented New President. Thank you all for your spirit, friendship, guidance, and fond memories. 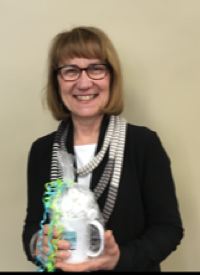 Thank you for your service to MSCH! The MSCH board thanks Greg, Mark, and Al for their combined 27 years of service to MSCH! Greg Heberlein MA, LP is stepping down from his role as Membership Committee Chairman after 6 years of service. Mark Gemmell PsyD, LP is stepping down as Board Secretary after 6 years of service. Thank you, Al Clavel, MD, for your service as President of MSCH! 15 years of service so far! We welcome you to the role of Past President and Education Committee Chairman! MSCH is excited to announce our New President! 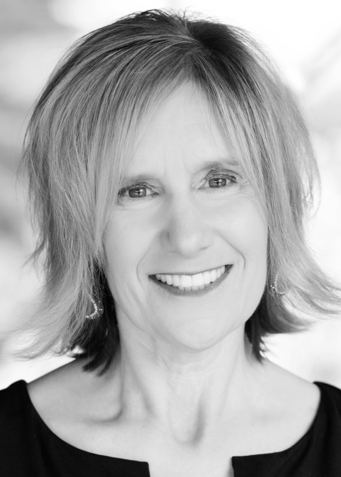 Welcoming Our New President, Cheryl Bemel PhD, LP! We are truly grateful that you have been willing to step into the position and give your time and talents to our organization! It is a pleasure to announce that Lisa and Catherine have joined our board! 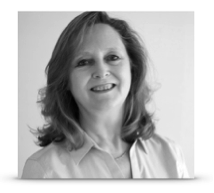 Lisa is an LMFT working evenings for Therapeutic Services Agency. She works full time as a school psychologist in the St. Francis school district. She is eagerly looking forward to ‘retiring’ from the schools so she can do therapy full time. Lisa has a passion for dogs (puppies are the greatest! ), gardening, needle crafts, and, of course, hypnosis. I provide psychotherapy to women, men and adolescents in my private practice. Areas of interest include: peri and post-partum mood disorders, anxiety, bipolar disorder, depression, recovery from chemical dependency, and trauma work including recovery from physical and sexual abuse and refugee trauma. Some of the tools I use to address these concerns include: CBT, DBT skills, EMDR and hypnosis. Most of all, I seek to find the strengths in my clients that they can use to find healing and serenity. ALL MSCH Memberships for the 2017-2018 calendar year WILL EXPIRE ON June 30, 2018. I love to hear stories like this one: perceptive, creative people see connections that transcend the boundaries of their field; they then explore and develop those insights, evolving them over years of practice and experimentation; ultimately going on to make creative and inspiring contributions to a field completely different from the one in which they started. Albert Pesso and his wife Diane Boyden Pesso began their careers as dancers, learning from some of the brightest lights in the dance world at the time. When they established their own dance center in the mid 1950’s, they encouraged dancers they were training to allow their bodies to express their inner feelings. When they observed that the resulting catharses were not necessarily healing, they went on to develop an interactive model of working with emotional wounds which included spatial relationships, specific wording, and physical touch to provide a reparative response from the outer world to each of the emotional needs expressed by the individual. This became what is now known as Pesso Boyden System Psychomotor (PBSP) Therapy. The Pessos believe that this process facilitates the creation of new body-based memories to complement the memories of emotional deficits and wounds in the past. importantly, as you might imagine for people immersed in the physicality of dance, emphasis is given to the embodied, affective/energetic manifestations of these patterns and the importance of accessing those as a key to effective change. Jim invited us to do a couple of brief experiential exercises in dyads to get a flavor of some key elements. In the first we simply took turns holding our partner’s hand, and provided space for the partner to express exactly how he or she wanted the contact to be delivered (pressure, location, etc.). This highlighted an important feature of the PBSP model: the therapist follows the client, reflecting a deep trust that the client accessing emotion and its associated sensations in the body will unlock the essential knowledge and energy that will lead to the healing reorganization of perception and action in the present. In the second exercise, we invited our partner to bring to mind a memory of a difficult experience. When the memory was activated, the partner was invited to ask for touch on the arm or shoulder (again with complete freedom to be very clear and precise about location, pressure etc.) and for the words they needed to hear at the time. It was clear from my experience that the physical contact accessed a different level of my experience and added a subtle but very powerful impact. 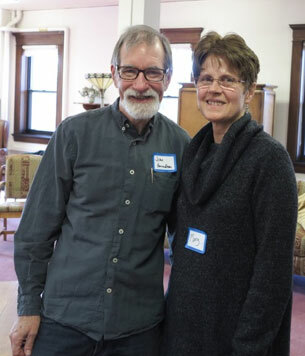 In the final segment of the workshop, it was delightful to observe Jim skillfully and fluidly create and conduct a “Structure“ with a volunteer who had come to the workshop specifically for the opportunity to be the “client.” Through a brief interview and “microtracking” Jim helped the client identify a particular issue and connected wounding experience/resulting emotional deficit. Once that was established he helped the client facilitate a reparative experience. Since PBSP work is typically done in a group workshop setting other participants are incorporated into the Structure, serving as ideal parents. 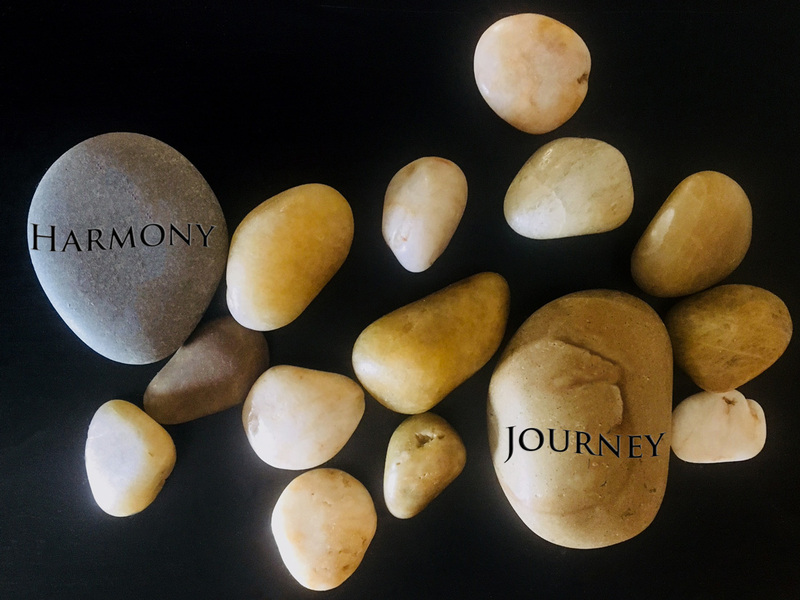 So the client selected several of us to play certain roles, and the process continued with Jim and the client collaboratively orchestrating experiences which provided symbolic fulfillment of the basic developmental needs most relevant at that particular developmental stage. The client’s feedback was continually elicited to make sure the experience was just what was needed and what would be believable. There was a fascinating additional element to the process, intended to address “holes in roles” i.e. the wounds and unmet needs of the client’s caregivers or other significant others which creates a “Double Whammy” for the client. 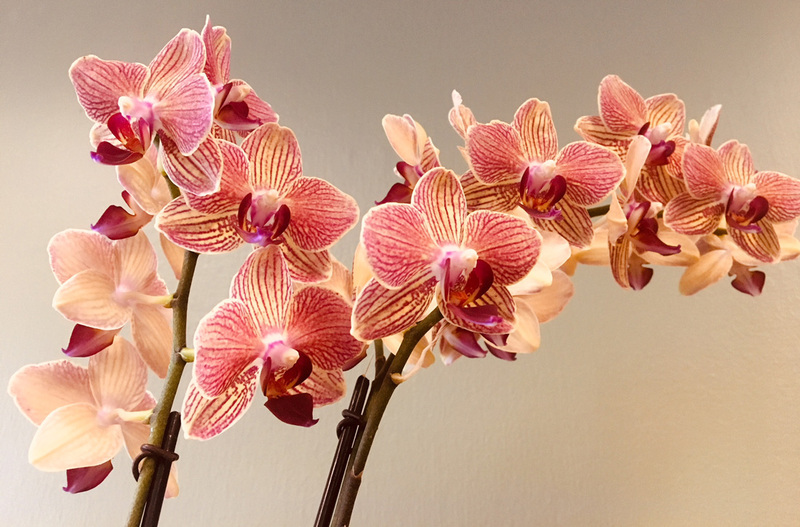 Quoting again from Al Pesso: “First, the client’s basic developmental needs are not met and that has negative consequences on her normal maturational processes, which would result in the absence of emotional security or a regular sense of well-being. Second, her innate capacity for compassion has been too early awakened and over-stimulated by the sight of suffering loved-ones. The consequences of this are deep, dark (in the sense of unconscious) and disastrous to her natural inclination to act (without guilt) in her own self-interest. This kind of history is the foundation of a life-long pattern of attending to the needs of others at the expense of neglecting one’s own needs.”) Jim orchestrated this part of the process using of objects -pillows, stones- to symbolize these significant others and provide them too with the ideal parents/caregivers they needed to heal their wounds, relieving the client of the need to do so. and accessing unconscious information and resources to create a new healing experience. It was a great pleasure to see Jim’s fluidity and mastery. Overall, a really wonderful and satisfying way to spend a Saturday morning! 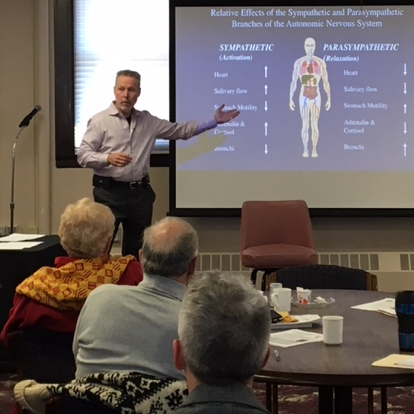 MSCH members and guests were treated to a highly informative presentation by Michael J. Maley, PhD, LP in Brainspotting, on Saturday, December 9th, 2017. Brainspotting grows out of the work of Francine Shapiro in EMDR and was developed by David Grand, PhD. 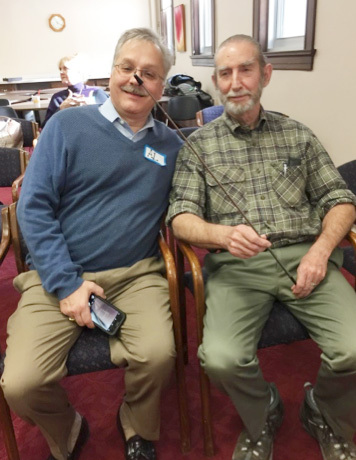 It was David Grand’s discovery during a modified EMDR session that clients’ eyes would stop during scanning at a point in the visual field and stay there. The assumption was that a deeper level of processing was occurring. Current neurological models suggest that a fixed focus versus continuous scanning may allow a more direct connection to the midbrain and brainstem circuits that mediate traumatic reactions and memories. Brainspotting is considered a brain-based therapy, based on the strong linkage between the visual system and the brain. Like EMDR it uses the visual field, but uses it specifically to locate positions that correlate to relevant inner neural and emotional experience. In actual Brainspotting practice, a pointer is waved slowly back and forth in front of the client who is instructed to follow the tip. It is theorized that certain autobiographical memory circuits are formed during a traumatic experience itself, and further, that specific points in the visual field are connected to those specific circuits. As the client follows the pointer with his or her eyes, there are clear and sometimes subtle interruptions and interferences—the eyes will stop following the pointer. Or it can be that there is some kind of response observed such as suddenly readjusting one’s posture, or eyes tearing up, or a sudden cough or clearing of the throat. These indicate that specific circuits have been activated related to traumatic experience, and are often partially recalled in that moment. Even in the absence of discrete memories, the client will begin to experience some processing, some sense that more information is becoming available—as Dr. Maley suggests, it is as though a portal has opened. The client is encouraged to be observant, mindful and simply notice “what is coming up for you.” This process of being the observer to what is emerging rather than the conscious initiator of it is called subcortical processing as contrasted with cortical processing. It was William James, great American psychologist and philosopher, who first observed this relationship between vision and feeling. Many MSCH members are familiar with the contribution of NLP (Neuro Linguistic Programing) related to eye movement and “visual accessing cues,” the observation that eye movements correspond with different processes and hemispheres in the brain (Bandler, Grinder, DeLozier, 1980). The basic experiment is this: ask someone to picture their grandmother. Their eyes will likely look up and to one side. Ask the person to picture their grandmother with purple spiked hair and facial tattoos. Their eyes will look up and to the other side. Brainspotting is another step in the truly fascinating evolution of techniques allowing us to engage brain processing directly. While the obvious application is trauma, it is likely to have great utility in a broad range of conditions ranging from anxiety, to depression, to phobias, OCD, and pain. Many thanks to Dr. Maley for a thoroughly enjoyable Saturday morning seminar! Delle Jacobs, LICSW, LMFT gave a very interesting talk on the techniques and uses for self-hypnosis. She compared her definition of hypnosis with historical views. She discussed a rational for why it is important for therapists to personally utilize self-hypnosis as well as teach their clients. She sensitized us to be aware of cultural differences in what might be considered universal cues. All in all, I thought it was very well done! What a delightful day spent with Mark Weisberg and fellow MSCH members, remembering our dear friend, Shep Myers! 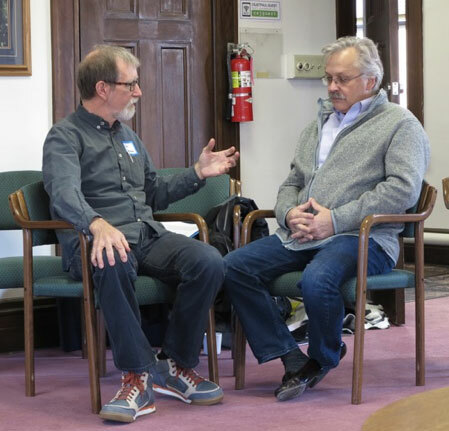 At this year’s retreat Dr. Weisberg presented: “Psychodynamics, Attachment and Physiology: Hypnosis and the Healing Brain/Body.” The day was filled with lecture, discussion, and small group didactic practice. Employing such variety in the learning experience, MSCH members were able to explore the material in ways that allowed them to be ready to use it Monday. Dr. Weisberg stated, “Hypnosis is a tool to activate resources.” Throughout the day, this idea could be noticed in the discussions of psychoneuroimmunology, polyvagal theory, dissociation, attachment, and treatment of problems such as post-traumatic pain, back pain, depression, anxiety, IBS, and headaches. Psychoneuroimmunology (PNI) is “the study of bi-directional interactions between the mind/brain, the nervous system (endocrine system) and immune system.” At the core of PNI is the idea that the mind and body are connected by messenger molecules, which allows for intervention (of specific interest to us- hypnotic intervention) for mind-body healing. For more information see Ernest Rossi’s work. Dr. Weisberg encouraged us to let the body inform the work. Specifically, he shared that pain is detected by the limbic system and brain stem before the frontal cortex. Thus the body has experienced pain before the rational brain has made meaning of it. Time was spent discussing the autonomic nervous system (ANS), which is comprised of the sympathetic (S) and parasympathetic (P) nervous systems. 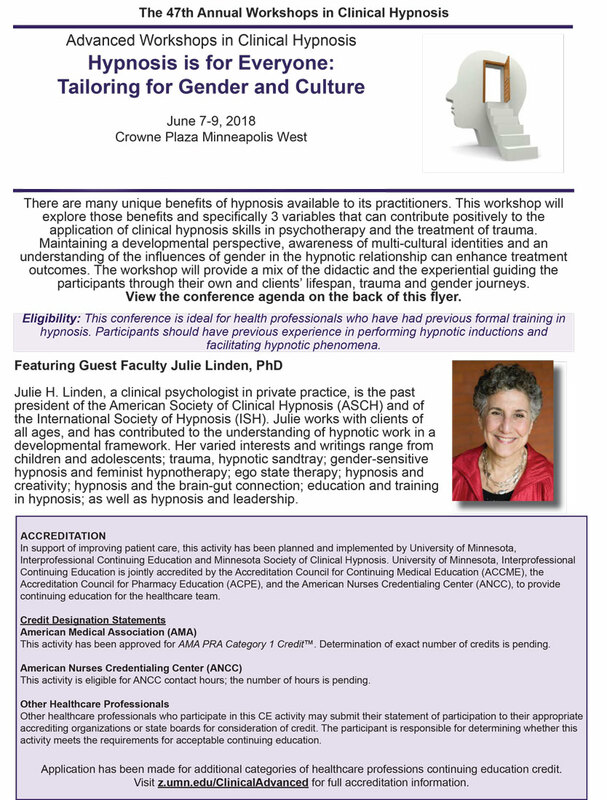 He encouraged participants to see hypnosis as a tool to “optimize S-P balance.” The ANS naturally ebbs and flows between activation/arousal and calm/settled states. By identifying autonomic dysregulation, we can begin to craft interventions to help restore balance by noticing how the patient may be “stuck” (i.e., on “on” mode or “off” mode). 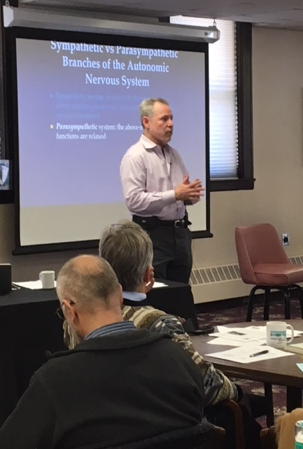 Dr. Weisberg shared how polyvagal theory expands our ideas of the autonomic response to stress while providing us with ideas to regulate the social engagement system as well as encourage autonomic balance and flexibility through various hypnotic suggestions and imagery rehearsal. For more information on polyvagal theory see the work of Stephen Porges, Ph.D. Emotions are experienced in the body. The only way to identify emotions is through visceral experience. The brain is what makes meaning of the signals/sensations of the body. Invite patients to step into the sensation or “pull up a chair” and sit next to the sensation and just observe it. Giving the patient permission to release any expectation of “fixing” the sensation/pain and just observe provides him/her with (often) a new experience. 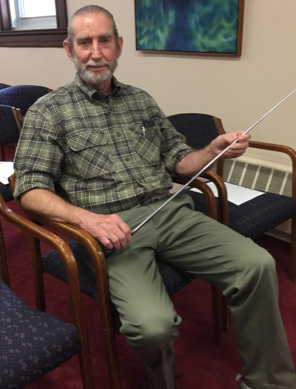 Dr. Weisberg encouraged participants to add “minimal or no content, only statements providing encouragement to stay with the sensation” during the small group didactic exercise. When the group discussed the process afterwards, many participants shared that it was interesting to observe their sensations/pains, how they changed, and even how they moved in the body. Through this process it is hoped that clinicians and patients/clients will learn, “when the pain is no longer a threat, it can start to subside.” Attending to the sensations of pain without guarding or fighting allows for the limbic system to “re-encode” the sensation as less threatening. Talking to parts of the brain such as the insula cortex. Allowing for suggestions of “well enough” and “being safe enough” to be processed. Using truisms as a way to reach the limbic brain. When the limbic brain recognizes something as true it is more open to the suggestion of what is possible/could happen. Allowing the parasympathetic nervous system to calm the system by incorporating breathing techniques such as 4-4-8 breathing and/or using imagery such as Elgan Baker’s script of the beautiful house in the woods. These techniques were demonstrated and practiced. Very practical, and I must share that since the workshop, I have used the beautiful house with clients and they have found it incredibly helpful. Using state dependent learning as a way to recreate the moment. For example, pairing new music to new experiences so when the music is heard later, it allows for memories and visceral responses to be experienced again. Utilizing the senses of sight, sound, smell, taste, and touch offer up ways to explore comfort, motivation, desire, and so forth while providing an anchor for experiences in the future. Thank you to Dr. Weisberg for sharing your extensive knowledge and giving us more to think about and explore! 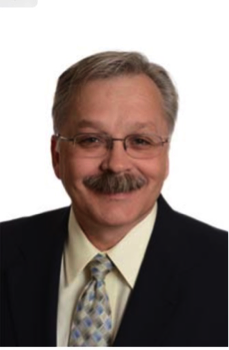 Dr. Mark Weisberg is a Board-Certified Clinical Health Psychologist in Minneapolis, Minnesota. 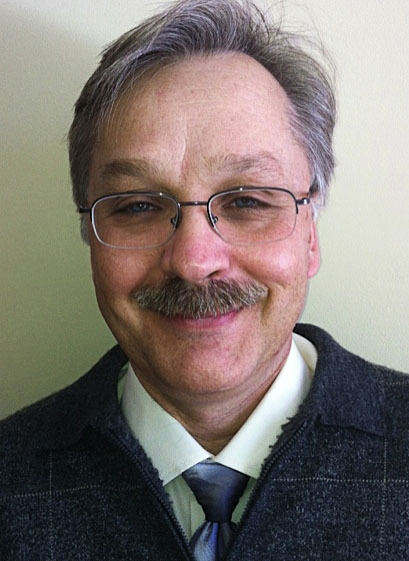 He is Adjunct Community Faculty, Academic Health Center, University of Minnesota. 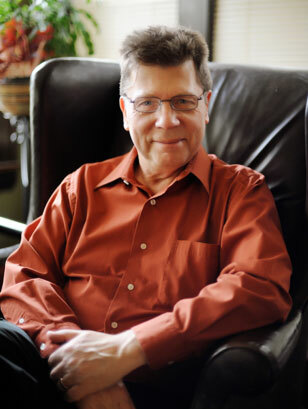 He is a Fellow of the American Psychological Association, American Society of Clinical Hypnosis, and American Academy of Clinical Health Psychology. 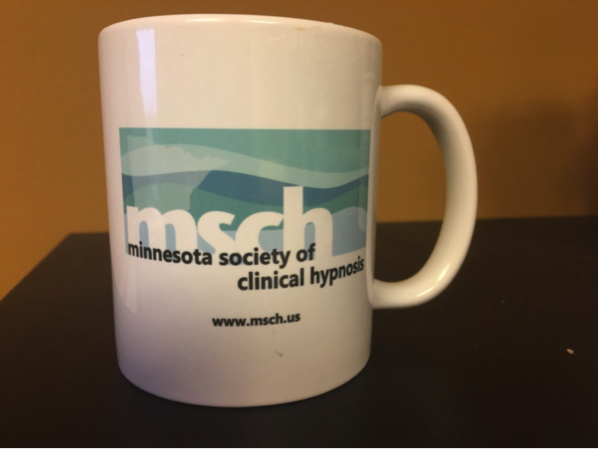 Additionally, he is a past president of the Minnesota Society of Clinical Hypnosis. He also consults at the Minnesota Head and Neck Pain Clinic in St Paul MN and maintains an independent practice in Minneapolis MN. 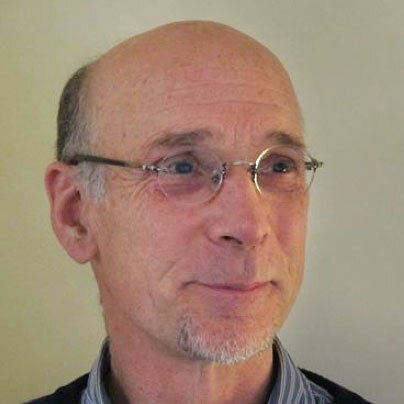 Dr. Weisberg has been involved in clinical practice and consultation in integrative mind-body medicine and treatment of chronic physical conditions for over 25 years, and teaches nationally and internationally on these topics. He has many publications in the medical, dental, and psychological scientific literature. 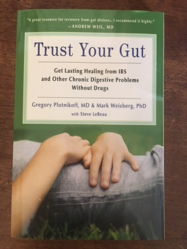 He is the co-author of Trust Your Gut: Get Lasting Healing from IBS and Other Chronic Digestive Problems Without Drugs (Conari Press, 2013), a consumer book on integrative treatment of digestive disorders. Were you the type of child who loved to draw? Sprawled out on the floor, or sitting at a table, with your crayons, markers or freshly sharpened #2 pencils, immersed in the experience? Maybe you can remember the smell of your drawing instruments, or the sounds they made moving across the paper or other drawing surfaces. Experiencing joy or excitement… playfulness or curiosity… calmness… perhaps a bit in trance. Whatever it was, your young mind was fully engaged in the imaginative, visual, tactile, and other sensory pleasures of creativity. For many adults, this pleasant act of drawing ended in childhood. Unfortunately, early art experiences of embarrassment or shame might have created an enduring belief of “I can’t draw,” or it “won’t be good enough.” Then add in the competing demands of time and responsibilities as we mature. Not surprising, many adults give up on their abilities to draw. With all these possible discouraging factors, you might well be thinking: How in the world could drawing possibly be contemplative? 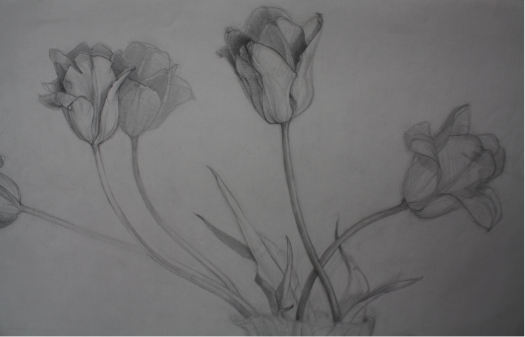 Drawing, by its very basic nature, is a way of seeing and “touching” the objects in front of us. As children, that is just what we did… before we thought our drawings had to be something to please someone else. The energy of our attention went into the object of delight or curiosity – not into some preconceived expectation of what the final product “should” look like. Creativity is often described as a process comprised of five factors: preparation, incubation, intimation, illumination, and verification (Wallace, G. 1926. Art of Thought). So instead of thinking of drawing’s ultimate purpose as making “good art,” maybe we should reconsider drawing, at its foundation, as a creative contemplative practice – one of preparing, incubating and intimation (then letting the later stages of creativity happen later! 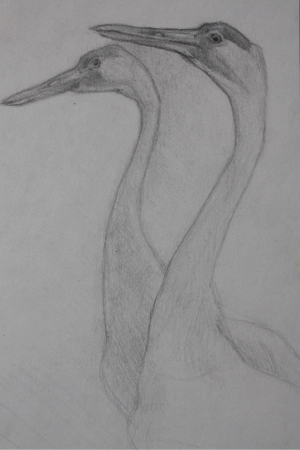 ), and allowing your drawing experience to truly be the creative contemplative practice of Beholding. By really seeing – not stereotyping or expecting or finalizing anything. 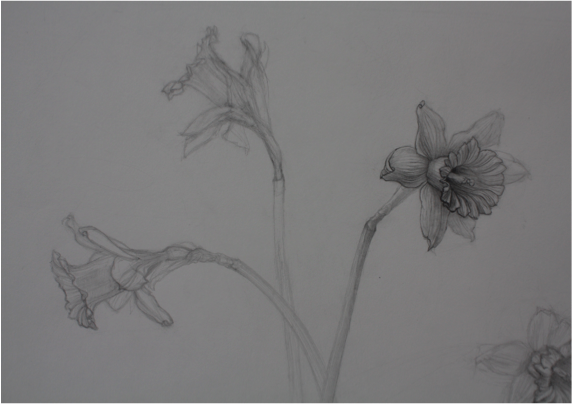 For myself, drawing is best experienced as an exploration, rather than a drive towards a final product. Granted, I must give myself permission, over and over, to do so. But if I allow myself to get curious in just one aspect of that which is before me, what I’d really like to get to know better, it’s a delight. Be it a certain curve or fold or line, whatever, as long as I resonate with it and be with it. So allow yourself to be quiet and take the time to really see (prepare and incubate) and then, when ready, intimate it on paper – drawing just the suggestion, the impression, the hint of what interests you. Allow yourself to enjoy the movement of your eyes, and arm, your wrist and fingers. Play with how hard or soft you can press your drawing instrument to the drawing surface, exploring hard blunt edges or smooth tapered edges. Maybe play with quick or slow motions. Do it over and over again. Not to get it right, but to get the vision and feel of it. In time, with practice, you may use this knowledge to turn later drawings into a final product. But for now, let this be a joyful, mindful practice. 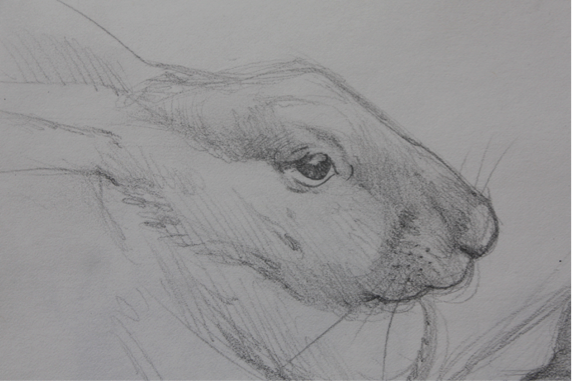 Over and over, remembering its creative contemplative purpose: drawing as a private beholding. And by adopting this stance, maybe – just maybe – one can recapture the child-like and foundationally human joy of drawing.